After having many jewelry boxes as a kid and traveling, this is what I now use as a jewelry boxes. These were found at Dollar General near the craft department. They are great for keeping bracelets, necklaces, earnings and other hair stuff. Here is a similar clear plastic storage organization container from Amazon that has more compartments. For Christmas I got this great bathroom organizer for traveling from LL Bean. I think it is great to travel with for planes as well as weekend trips. I have the medium size one. 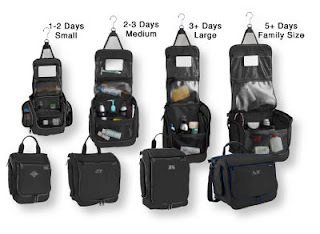 These are great for cramped cruise cabins or rooms you are sharing with friends and family. Each member of the family can have one. I have been in a cruise ship room with my parents and sister and those bathrooms are tiny! Sure you need a plastic bag to add your liquids, pastes, and gels for your checked bags but adding other is helpful too. Put these in your bag for things you can not throw away right away (A dirty diaper comes to mind for me). Or for a wet bathing suit at the end of your trip.